So we're on to Day Two with Tim's 12 Days of Christmas Tags, and I'm improvising once again, as I don't quite have all the products Tim used. It's all about inspiration, right? I actually made this tag twice, and threw the first one in the garbage. Note to self, if you think the Enamel Accents will not work with your sentiment, don't try it! 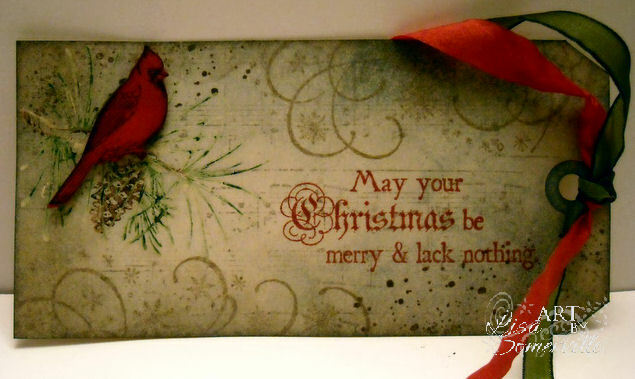 I luv it, the cardinal is perfect for the tag! Terrific tag Lisa, especially love your wonderful bird and the subtle music in the background. Beautiful tag. Love the soft effect on your background. Hi! What do you know 3rd time lucky!!! Ooo, this is gorgeous! I love the stamping, and that cardinal stamp. Thanks for joining the Simon Says Stamp and Show Challenge! Beautiful variation on the original. Love that bird stamp.